I heart breakie. I really do love me some breakfast. (See previous post – more breakfast talk.) My good ol’ standby is oatmeal with “sprinkles” (ground flax, crushed walnuts, pumpkin seeds, sesame seeds). Mmmmm. With a hot cuppa joe…nothing betta! So when Bethany Butterworth of Bread and Butter pottery brought in her latest wares, I knew this would make the mostest awesome cereal lovers Valentine’s gift. Picture this – your cereal lover wakes up groggy on Valentines morning (Monday February 14!) 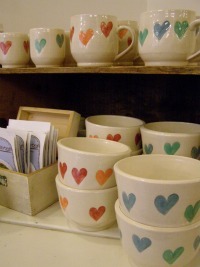 to find a hot cuppa joe in his/her heart mug and steaming oatmeal in his/her heart bowl (perhaps with “sprinkles”?) You are gonna win big points.